Hello, I am Miss Hannaford. I am a Teacher Librarian in a High School in the south west of Sydney. I have been performing the role of Teacher Librarian since January 2010. Before I was a Teacher Librarian, I was a Visual Arts Teacher and I am still a Puppeteer and Puppetbuilder. I am mad about integrating technology in all its forms into teaching practice. My particular area of expertise is in with Adobe and Microsoft Office. What I like to do is, to work out ways teaching and learning can be made easier NOT harder by using technology. I train teachers and my pet presentation is Captivate Me! Using Adobe Captivate 4 to enhance teaching and learning as well as PowerPoint in the Classroom- how to avoid death by PowerPoint. I write how to guides for the technology I use and present- mainly because if I write down the explicit steps I don’t have to remember it but people like my guides because it is explicit with lots of screen shots and arrows pointing at things to click. Since I taught myself Adobe Captivate 4, I now make how to videos for myself, students and colleagues across the state. 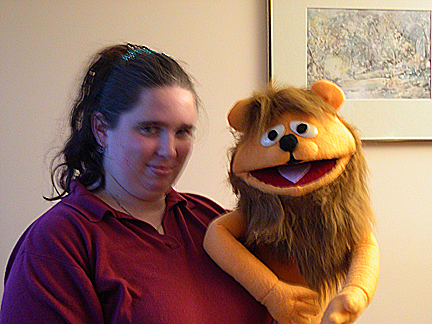 I promise to add some more pictures here soon- just a matter of making some time and convincing my puppets to stand still long enough for me to take a picture.